A couple of years ago, a friend gave us a physical bitcoin, suggesting we should take an interest in cryptocurrencies. We searched high and low. We couldn’t find it. Did we give it to our grandson? Did it end up in the laundry? Did we give it to a porter as a tip? It must be somewhere. We’ll keep looking. Will This Law Force Trump to Legalize Pot for Whole Country? Pot stocks are unstoppable. Every time a state legalizes marijuana, new millionaires are made. Trump can’t stop it. And this new law could force his hand to legalize pot for the whole country. Setting off a marijuana mania bigger than anything we’ve seen before. You don’t want to sit on the sidelines for this. To see the 3 pot stocks to buy right now, click here. They’re ba-aa-ack. Whether it’s the Chinese, or the Koreans, or the Russians or us Americans is anybody’s guess at this moment, but what it looks like for a few cryptocurrency players out there is that the Chinese have found a new way to get back into the game. Earlier this month, China banned initial coin offerings (ICOs) – a way crypto ventures raise capital – and crypto exchanges, websites that allow you to exchange your government fiat currency for cryptocurrencies. And this morning, Japan – the main beneficiary of China’s clampdown – approved 11 cryptocurrency exchanges. Money talks, and it’s hard to argue with people who are getting rich. For instance, subscribers of Palm Beach Confidential, one of the advisory services from the Palm Beach Research Group, have had the chance to strike it rich on recommendations from colleague Teeka Tiwari. Last April, after it had just launched, Teeka recommended what’s now the world’s second most valuable crypto asset. Then, it was about $9. Now, it’s over $300. And in February, he recommended one of the hottest Chinese crypto ventures. It was 12 cents at the time. Today, it’s selling for more than $32. Let’s see, if you’d invested $1,000, you’d have more than $250,000 now. Finally, we checked with our son Will, the Bonner family’s in-house cryptocurrency enthusiast. A while back, he urged us to speculate with some of the family money in the crypto casino. “We’re up about 85% since we invested in June,” Will reported back. Will is more open-minded than we are. He likes technology… and believes it will improve the future. We’re not so sure. The last tech innovation that clearly improved our lives was air conditioning, invented by American engineer Willis Carrier in 1902. When we could finally afford it, in 1990, it made the Maryland summers much more agreeable. Penicillin, discovered by Scottish scientist Alexander Fleming in 1928, was a big help, too; it saved our lives when we had pneumonia in 1954. As for the rest, we could take them or leave them. As far as we’re concerned, they’re still a novelty… and, as money, still unproven. So, we do not advise following our example. Not unless you can lose your money but keep your sense of humor. Bannon and the Mercers also stand out as more pugilistic in their tactics and ideology, bonding less over a shared cohesive political ideology than over a desire to disrupt the political establishment – the Republican establishment in particular. When Team Trump’s tax reform push fails, they are going to need someone to blame. They won’t blame themselves, of course. Neither for being unable to come up with a plan their party could fully support… nor for misleading the public by offering to do something they couldn’t do (pass a major tax reform)… nor for even greater deceit of promising something that no one could ever do (boosting real growth by cutting taxes without also cutting spending). Unless the feds cut spending, a tax cut is a fraud. When the tax reform measure fails, what will its supporters do? Always here to help, we suggest the Trumpistas in Washington “fall upon their swords,” like Cato the Younger… or open their bellies with a knife, like the last true samurai, Saigō Takamori. Instead, they’ll blame the Republican leadership in Congress. Which is all right with us, too. House Republicans are mostly swamp critters. Over the last 137 years, there have only been three times the stock market has been this overvalued. The Great Depression (95% overvalued)… dot-com bubble (164% overvalued)… 2008 financial crisis (65% overvalued)… If the majority of your investments are in mainstream stocks, you’re practically begging to be crushed when this market melts down (which could happen at any moment). Click here now to learn about the “lone-wolf investment strategy” that’ll take you outside of the equities market and position you for a possible million-dollar nest egg, even when stocks plummet. Whatever comes of it, the proposed tax cuts won’t help the middle class or the economy. The Deep State controls the feds… and most emphatically, it controls the details of tax policies. It doesn’t matter what the news headlines report… or what POTUS tweets… The devil in those details will make sure that the swamp gets more, not less, of the nation’s wealth. Mr. Trump calls his tax proposal a “miracle for the middle class.” Yes, it would be a miracle if it passed. And it would be another miracle – like turning base metal into gold – if it did anything for the middle class. Our friend and budget advisor to President Reagan, David Stockman, calculates that the typical middle-class family could expect annual tax savings of precisely $5. With that money, you might be able to buy a “Make America Great Again” hat on eBay. The feds… the swamp… the Deep State… and the Trumpistas in Washington – all are sucking on the economy like leeches. They disguise and delay the damage with their phony reforms… fake money… fraudulent statistics, and flimflam claims. The first crisis will be a crash and a depression. The second – after another massive “stimulus” from the authorities – will be raging, bubbling inflation. …which will be about enough to buy a coffee at Starbucks. 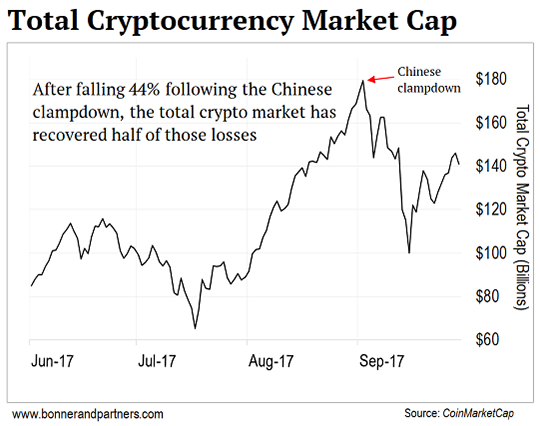 As Bill mentioned above, following the clampdown by the Chinese government, the crypto market took a hammering. The crypto market cap fell 44% peak to trough. But as you can see, since then, it’s made back half of those losses. Mike Novogratz is starting a $500 million crypto hedge fund. He reckons cryptocurrencies are going to be the “largest bubble of our lifetimes” – a bubble, he says, that will make investors insanely rich on the way up. The Chinese government wants to stop people from swapping government fiat money for bitcoin and other cryptocurrencies. But this 31-year-old is creating a crypto exchange that will be impossible to shut down. Team Trump reckons lower taxes will be an economic miracle. But the formula for economic success has nothing to do with taxes: Make more stuff with less (aka productivity). Today, readers weigh in on the latest issue of Bill’s monthly investment letter, The Bill Bonner Letter (paid-up subscribers can catch up here), about why it’s time to “sell” the U.S. I read your article and conclusions regarding America. I agree with you that we are on borrowed time. I see, in addition, a coming civil war. I think the divisiveness that exists today is so far along that civil war is the inevitable consequence. It is a shame… America was such a great concept. For the last few years, I have noticed a general decline in values of every kind: manners, caring for and about others, honesty, work ethics (seems that is the worst), and the ability of the majority to think for themselves. Government handouts using the hard-earned money of those who do work seem to have destroyed in the majority now, any desire to provide for self. I look forward the reading your future articles. I share your views… Buy real estate in the U.S. in what we perceive to be safer areas. Buy gold (coins). But even better… buy silver dollars. Do you really want to spend that $1,400 1-ounce gold coin on a loaf of bread at the 7-Eleven? Save it for bigger expenses (chickens, donkeys, ammo, etc.). As regards digital currencies, I don’t believe Farmer Brown or your neighbors will be accepting bitcoin after the fall!